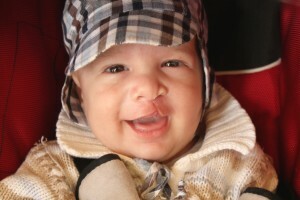 About 1 in 1000 babies in the US are born with cleft lip or palate. Clefts are developmental irregularities that occur when the palate, gums, and lips do not join properly during fetal growth. At Piney Point Oral and Maxillofacial Surgery, our Houston, TX surgical team provides patients custom, multi-disciplinary treatment plans to treat cleft lip and palate, and related oral and overall health concerns. Bone grafts – when permanent teeth begin to develop, patients may need bone grafts to adequately support teeth. Orthodontics including orthognathic surgery – many patients with cleft lip or palate will need to correct bite alignment, with traditional orthodontics (braces) or orthognathic surgery. Cosmetic procedures – as patients grow older and are able to be more active in planning treatment, they may wish to treat non-functional aspects of cleft lip and palate such as scaring. Speech therapy – once children begin talking, it’s essential to work with speech pathologists at the earliest indication that children may be experiencing difficulty speaking. If your child has a cleft lip or palate, contact Piney Point Oral and Maxillofacial surgery today. Our team of skilled oral surgeons will work with you to develop a customized treatment plan. by: Piney Point OMS at November 17, 2015 .